The author of this site contributes in various ways to the debate over extremism among Muslims. He comes from the unusual position of combining access to authoritative Islamic knowledge, practical experience of tackling such problems in the Muslim community, wide knowledge of local Muslim communities around the UK, and professional involvement in the criminal justice system. Material for the site is generated through voluntary efforts as time permits. Please return to the site at regular intervals for updates. If there is anything particular you would like to pursue, please use the comments facility to contact the author. In this iconoclastic paper the author describes how the failure of mainstream Muslim mosques and organisations to meet the needs of converts and young Muslims returning to the faith, lead these neophytes to seek alternatives. Although most alternatives and mainstream bodies themselves are wholesome, sectarian rivalries between those competing for the attention of neophytes then create an environment where individuals inclined to militant rhetoric inflate their claims to attract an enthusiastic newcomer. Even though such claims are often transparently nothing but empty bravado, some among those involved, perhaps the newcomer himself, perhaps a normally less militant rival, perhaps some of the 'armchair' militants, are motivated to 'prove' their dedication by moving on from rhetoric to dangerous action. In the current environment, ordinary Muslims have been frightened into remaining silent about militancy; and mosques are tightly managed by mainstream factions whose only security measure by which they keep control of the mosque is to prevent rival peaceful factions, along with possible militants, from taking any part in the events or running of the mosque. Consequently all the important conversations with the newcomer, convert or returnee, take place out of the limelight in discreet whispered conversations or in private meetings away from the mosque, where no one can interfere. Following the bombings of 7th July 2005, he submitted a report privately to the Home Office, and this was published by Advanced Research and Assessment Group (ARAG) of the Defence Academy of the UK in August 2006. The "Problems and Practical Solutions" paper is a summary of discussions of a range of issues that are being devloped through various forums. 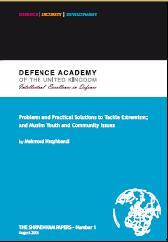 Other briefings on subjects such as 'radical' groupings, the status of imams, questions of identity and loyalty etc. will be added here as they become available. The set of practical actions detailed in my "Problems and Practical Solutions" is complex and interrelated. The UK Government's PREVENT strategy (part of CONTEST, it's Counter Terrorism Strategy), coincidentally addresses many of the same issues as my paper and recognition needs to be given to the complexities and interdependencies that link these issues. It is sadly perfectly possible that implementing a worthwhile policy without providing the right prerequisites, could have exactly the opposite effect to that intended. For example, I and others have made clear that traditional, closed and introspective mosque/masjid managements are a major obstacle to meeting the needs of second and third generation Muslims, causing some to move towards extremism without any challenge. But government pressure on masjids/mosques to open up to diverse interests, to be more democratic and accountable, will actually make them far more vulnerable to exploitation by extremists, unless steps are taken first to help imams, management and regular users understand how to recognise and resolve confrontational and problematic situations in an inclusive way. Several years have passed since the crisis events of 2001 and 2005, and while some counter-measures have progressed, others have retrogressed. This site will accordingly endeavour to provide suggestions for an overall strategy that shows the linkages, progress and obstacles. Interested parties include local and national Muslim organisations, local government, education, welfare and voluntary bodies, central government and police. © Copyright Notice All text reproduced here is copyright, ownership and intellectual property rights remaining with Mehmood Naqshbandi at all times. Mehmood Naqshbandi has asserted the moral right to be identified as the author of this work.